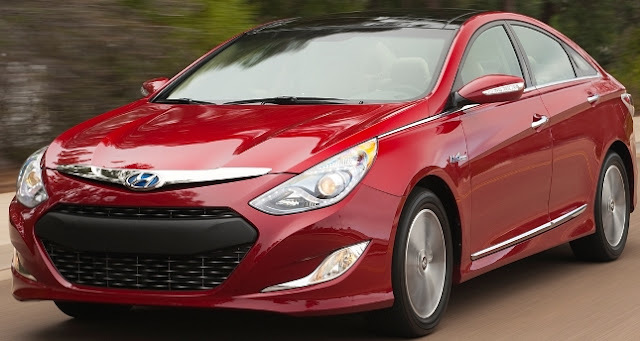 The 2012 Hyundai Sonata Hybrid powered by a 2.4L Atkinson Cycle 4-cylinder hybrid engine and equipped with standard Blue Link® telematics has an MSRP of $26,610 including the $760 frieght charge. The 2012 Sonata Hybrid delivers a 37 mpg combined city/highway rating from the EPA. Standard features include a 4.2-inch TFT multi-function trip computer with hybrid technology display, AM/FM/SiriusXM/CD/MP3 with iPod®/USB & Aux input jacks, Integrated Bluetooth® with phonebook transfer and Hyundai Blue Link Telematics system. The Leather Package for $1,500 MSRP that has leather seating surfaces, heated front seats and rear seat bottom cushions, leather-wrapped steering wheel & shift knob and auto-dimming rearview mirror with HomeLink® and compass. The Ultimate Package for $5,500 MSRP includes the Leather package contents plus panoramic sunroof with tilt & slide, 17-inch Eco-spoke alloy wheels with unique finish, navigation system with high-resolution touch-screen display, rear backup camera, Infinity® premium speakers, subwoofer and external amplifier (400-watt), HD Radio® Technology with multicasting, SiriusXM, NavTraffic, NavWeather and Sports & Stocks w/ 90-Day Trial, HVAC multi-mode button, Premium door sill plates, Glossy black door surround and outside mirror housing. Looks like a lot of car for the money not to mention the gas savings. Richard Saxton on KNX Radio with Business Hour host Frank Mottek discussing new sedan introductions at the Los Angeles Auto Show. The focus is on new vehicles from Cadillac, Hyundai, Lincoln, BMW and Porsche. Richard Saxton on KNX Radio with Business Hour host Frank Mottek discussing the highly popular new compact SUVs coming in 2012 - Mazda CX-5, Ford Escape and Honda CR-V. 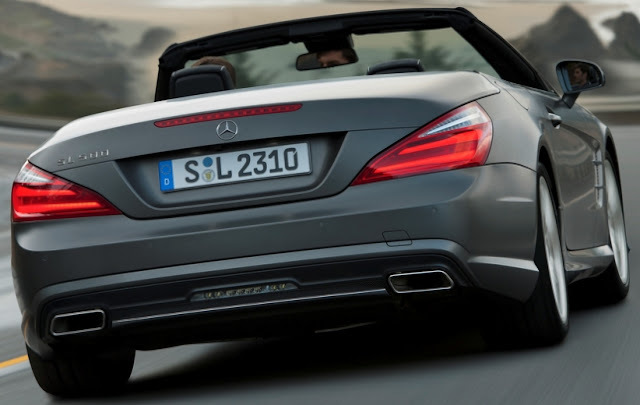 The 2013 Mercedes-Benz SL is almost 2 inches longer, 2.24 inches wider and 242 pounds lighter than its predecessor in an all-aluminum bodyshell with few components made from other materials. The designers used even lighter magnesium for the cover panel behind the fuel tank and roof. High-strength steel tubing is integrated into the A-pillars for added safety. The new V8 in the SL550 develops 429 horsepower from its displacement of 4663 cc, which is around 12 percent more than its predecessor despite some 0.8 liters less displacement. Fuel consumption has been reduced while at the same time the torque has increased from 391 lb-ft to 516 lb-ft, a gain of 32 percent. The SL550 takes just 4.5 seconds from 0 to 60 mph - eight tenths less than the previous SL550. The sixth generation of the 60-year old SL model has a retractable hard top that can be operated using a space-saving electrohydraulic mechanism, converting the SL from coupe to roadster and back again in less than 20 seconds. In contrast to its predecessor, the new SL offers two versions of the retractable hard top - glass or the unique panoramic roof with MAGIC SKY CONTROL. The transparent roof switches between light and dark at the push of a button. In the light setting it is virtually transparent, offering an open-air experience even in cold weather. In its dark state the roof provides welcome shade and prevents the interior from heating up in bright sunlight. The frame of both versions is made from magnesium, reducing weight by around 13 pounds compared with the outgoing model, lowering the vehicle's center of gravity and delivering greater agility. The FrontBass system which uses of the spaces in the aluminum structures forward of the footwell as resonating chambers for the woofers delivering clear, rich bass sounds even with the top down. The new layout has the added bonus of freeing up space in the doors and interior. MAGIC VISION CONTROL is a new wipe/wash system which dispenses wash fluid just in front of the wiper blade via channels integrated into the blade - in both directions of travel. The result is no water splash on the windshield to disrupt driver visibility and a perfectly clean windshield. The water also stays on the windshield, with no risk of overspray into the passenger cabin when the roof is down. A fully heated wiper blade is included as standard equipment, preventing the build-up of snow and ice on the blade in winter. This heating function also allows warm water to be applied directly onto the windshield for the first time, even in cold temperatures. The HANDS-FREE ACCESS system allows hands-free operation of the trunk lid by the driver simply moving their foot in the vicinity below the rear bumper. The 2013 SL550 will make its global debut at the 2012 North American International Auto Show and goes on-sale in the U.S. this spring. Stephen Cannon, 50, is the new president and CEO for Mercedes-Benz USA (MBUSA) effective January 1, 2012. He replaces Ernst Lieb who left the company in October. The announcement was made by Dr. Joachim Schmidt, executive vice president of sales & marketing for Mercedes-Benz Cars in Stuttgart, Germany, to whom Cannon will report. Cannon will have overall responsibility for the Mercedes-Benz, Maybach, Sprinter and smart brands in the United States. He will lead MBUSA's more than 1,700 employees and 356 dealers throughout the U.S.
Cannon's most recent post was vice president of marketing for MBUSA with overall responsibility for marketing communications, market research and product management of the Mercedes-Benz and Maybach brands in the U.S. Cannon began his automotive career in 1991 as executive assistant to the president and CEO of Mercedes-Benz of North America (predecessor to MBUSA). From there, Cannon moved to Stuttgart and joined a small team tasked with the development, manufacturing and launch of the M-Class, the first Mercedes-Benz SUV ever made in and for this market. The Ford Focus, Hyundai Elantra and Volkswagen Passat are the three finalists for the 2012 North American Car of the Year chosen from 17 vehicles: Audi A6 & A7, Buick Verano, Chevrolet Sonic, Chrysler 300/SRT-8, Fiat 500, Ford Focus, Hyundai Accent, Elantra & Veloster, Kia Rio/Rio 5, Scion iQ, Subaru Impreza, Toyota Camry & Prius V, VW Beetle & Passat. Finalists for the 2012 North American Truck of the Year are the BMW X3, the Honda CR-V and the Land Rover Range Rover Evoque. Others considered were Mercedes-Benz M-Class, Mini Countryman, Nissan Quest and Saab 9-4X. The Audi A7 won the first-ever Motor Press Guild Car of the Year so we'll see if that's a predictor. Last year the 2011 North American Car of the Year was the Chevrolet Volt and the 2011 North American Truck of the Year was the Ford Explorer. The winners will be announced in Detroit at the North American International Auto Show on January 9th, 2012. The 2013 BMW 6 Series Gran Coupe is a new 4-door addition to the 6 Series line with 4+1 seating offered in three models in the US. The 315 horsepower TwinPower Turbo 3.0-liter 6-cylinder powered 2013 BMW 640i Gran Coupe is the initial model arriving early this summer. Later in the summer, the 445 horsepower TwinPower Turbo 4.4-liter V-8 powered 2013 BMW 650i Gran Coupe and the all-wheel drive 2013 BMW 650i xDrive Gran Coupe will go on sale. All with the 8-speed Sport Automatic transmission. The Gran Coupe is 4.4 inches longer than its 2-door coupe sibling to enhance seating comfort for the rear passengers. The BMW 6 Series Gran Coupe features the BMW ConnectedDrive driver assistance systems and mobility services. Also available is the rear-view camera, Surround View, Parking Assistant, BMW Night Vision with pedestrian recognition, Lane Departure Warning System and Active Blind Spot Detection. The standard BMW iDrive control system is the operating portal for the navigation, communications and infotainment functions. The high definition, trans-reflective technology Control Display is centrally mounted high on the dash and emulates a freestanding flatscreen. There is the optional Bang & Olufsen High-End Surround Sound System. General Motors reported total sales of 180,402 vehicles in November, up 6.9 percent compared with November 2010 and year-to-date sales are 2,269,469, a 14.7 percent increase over 2010. Ford Motor Company's November U.S. total sales were 166,865, up 13 percent over November 2010. Year-to-date Ford sales are 1,938,666, up 11.1 percent vs. a year ago. Toyota Motor Sales, U.S.A., reported November sales of 137,960, up 6.7 percent over the year-ago month. Year-to-date Toyota sales are 1,384,558, a decline of 20.5 percent from 2010. Chrysler reported U.S. sales of 107,172, a 45 percent increase compared with sales in November 2010 and year-to-date sales are 1,231,095, up 25 percent from last year. Nissan North America reported record November U.S. sales of 85,182, an increase of 19.4 percent. Year-to-date sales are 941,607, a gain of 15.6 percent over 2010. American Honda posted November sales of 83,925, a decrease of 10.1 percent. American Honda year-to-date sales reached 1,042,055, down 5.7 percent versus last year. Hyundai Motor America November sales of 49,610 was a 22 percent increase compared with the same record-setting period a year ago. Year to date, Hyundai sales are 594,926, up 21 percent versus 2010 in total. Kia Motors America announced best-ever November sales of 37,007, a 39.1 percent increase over the same period last year and year-to-date sales are 442,102, up 35.7 percent. Volkswagen of America reported November sales of 28,412, a 40.7 percent increase over prior year sales. Year-to-date sales are 291,899, up 25.3 percent over 2010. Audi reported 9,700 vehicles sold in November 2011, a 3.6 percent increase over the previous all-time record set a year earlier. Year-to-date sales of 104,906 was a gain of 15.2 percent, topping the previous annual U.S. sales record of 101,629 set at the end of last year. Mercedes-Benz USA reported November sales of 28,255 vehicles, a 55.2 percent improvement over November 2010 for their highest November volume on record. On a year-to-date basis, the 236,415 vehicles sold represent a 20.4 percent increase over the same period last year. The BMW Group in the U.S. (BMW and MINI combined) reported November sales of 26,271 vehicles, an increase of 14.8percent from same month a year ago. Year-to-date, BMW Group sales are 272,873, up 14.6 percent in the first eleven months of 2011 compared to the same period in 2010. Mazda North American Operations reported November U.S. sales of 18,432, an increase of 20.4 percent versus last year. Year-to-date sales through November are 228,073, up 9.6 percent versus last year. Subaru of America reported November sales of 17,657, a drop of 15 percent from November 2010 and year-to-date sales of 233,288, a 1.6 percent decline compared to the same 11 months last year. Jaguar sold 915 cars in November, an 18 percent drop from 2010 and year-to-date Jag has sold 11,139, an 8 percent drop. Land Rover November sales were 3,820, a 31 percent jump over the same month a year ago and for the 11 months of 2011 Land Rover sales are 33,356, an increase of 18 percent. Combined, JLR sales were 4,735 in November, up 17 percent and for the year 44,495, a 10 percent gain. Mitsubishi Motors North America reported November 2011 sales of 3,735, down 13 percent from November 2010. Sales of Mitsubishi vehicles for calendar-year-to-date 2011 are at 73,988, a 45.6 percent increase over 2010. Porsche Cars North America announced November 2011 sales of 2,255 vehicles and year-to-date sales of 27,189, a 19 percent increase from 2010. American Suzuki sold 2,332 vehicles in November, down 22 percent from a year ago while year-to-date sales are 24,053, a 13 percent gain over 2010. Shown as a concept at the Los Angeles Auto two weeks ago with expectation of becoming a production vehicle, the SUBARU BRZ rear-wheel drive sports car featuring the Horizontally-Opposed Boxer engine, made its world premiere at the 42nd Tokyo Motor Show 2011 as anticipated. It was developed as a joint-project between Subaru and Toyota, as a sports car with superior steering response and driving pleasure that everyone can experience. The Subaru Boxer engine in the BRZ was positioned even lower than other Subaru models so that the BRZ has one of the lowest possible centers of gravity on a light-weight chassis for handling character.